BARBEQUE WITH STUDENTS ON "UMI NO HI"
Last Monday I had a great time going on a picnic with some students and another staff member, Tim, from the Kyobashi School. 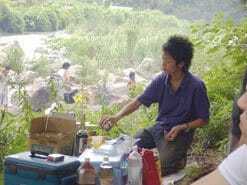 We were all able to take the day and go out to a natural river area as it was a national holiday. This is actually the second time I've been invited to participate by this student and this year there were even more people in attendance. We all had a great time and I feel very lucky that these students look at me not just as a teacher but as a friend and want to include me in this part of their lives. In the end we got rained out but by then everyone was so full that we didn't mind packing up. It was a great, fun, full day with some students in Japan's beautiful natural setting. We started out by waking up in time to get to the meeting place by 9AM. I was really surprised when I was told to meet at such an early time! I would understand why later. 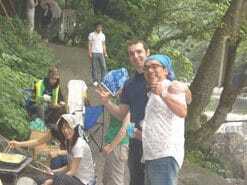 Actually I was in a second group of people going to the barbeque spot, the first group went hours earlier! This was in order to secure a good spot for our group. Some members, including the student who had invited me, woke up at 5AM to get started and lay out a spot for us. When I arrived I was really grateful. There were people everywhere! I guess this was on account of it being a national holiday called "Umi no Hi". It can be translated to mean Ocean Day and many families take trips to places they can go for a swim. Speaking of that, due to recent heavy rainfall the river had swelled to nearly twice the size it was last year. People were swimming all over the place, especially young children. Some people were even net-fishing for tiny river crabs. It looked like great fun. Unfortunately for me, I hadn't thought ahead enough to bring a pair of swim trunks which sorely regretted. The water looked great and the river was definitely clean and deep enough to swim in. Even though not all members in attendance were students at Smith's Kyobashi, it was clear that everyone had interest in English. 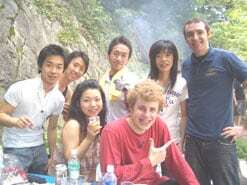 Some students have been studying English for a long time and felt comfortable speaking to me and Tim in English only. Even other members who aren't actively studying English at the time were joining in where they could. I remember fondly when I mentioned that the cookies looked delicious, a man nearby me turned to the other Japanese members and bellowed in a great confident voice, "Cookies… please!" I guess his close friends who knew him well were surprised to hear him suddenly speaking English because everyone had a good laugh. These moments were frequent throughout the day with old friends, students, and new friends alike making their best effort to communicate and take advantage of the opportunity to use their English with a native speaker. This is one aspect of Japan that has always impressed me. The amount of English that the average Japanese person can use when they need to is amazing. English is a very important part of their compulsory education and it really shows. People who have been out of the education system for years, and who don't technically have a need for English in their daily professionally life can still turn around and ask someone to pass the cookies in English if the opportunity presents itself. Later in the afternoon we started to feel some raindrops. There was some food left though so we just kept grilling! It was such a nice natural environment that we didn't mind a few raindrops. On the contrary it even felt refreshing! By the time we finished eating and packed up all our gear it was a total downpour and we walked back to our cars in the rain, full of great food and refreshed by beautiful nature. ​I'd really like to thank my students and their friends again for inviting me to come along. Great food, great location, great friends. I'm also grateful that I'm part of a flexible, monthly-payment system English school here in Japan that allows me to interact with my students and friends freely in a positive environment. Everyone had a good time enjoying nature, speaking English, and just having a good time in general.I hope I can go again next year!